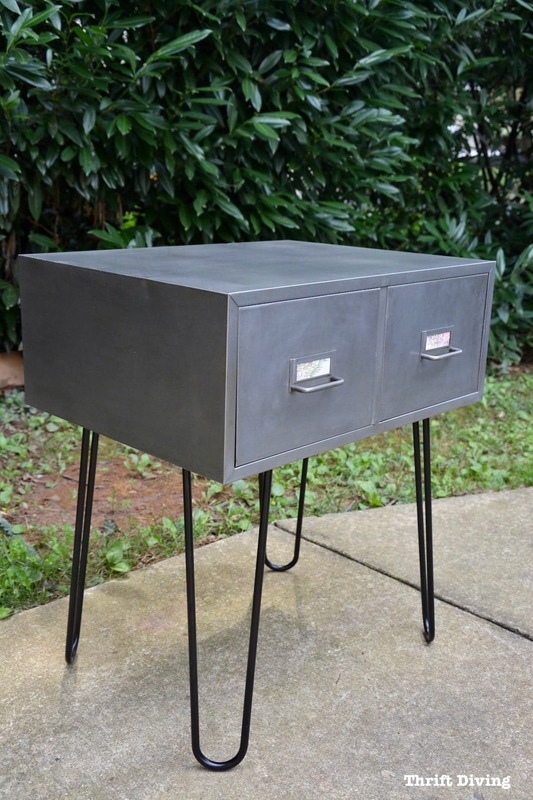 I wouldn’t necessarily call myself an industrial furniture kind of girl, but this vintage metal cabinet makeover with hairpin legs may have converted me. Several months ago while hanging out with Thrift Store Pete, he was showing me some pictures of projects he had done and sold at a show. 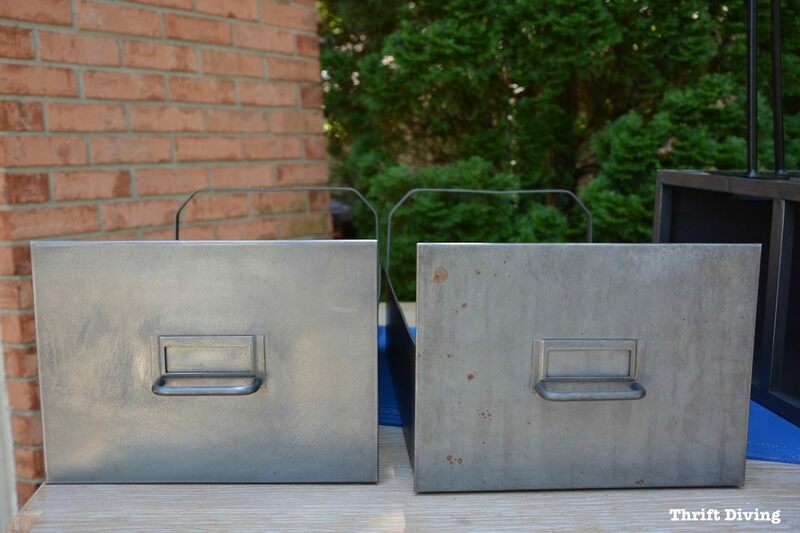 The hot item that people couldn’t get enough of were those vintage metals cabinets that Pete had been stripping and turning them into industrial mid-century modern pieces. My mind instantly flashed to a bunch of industrial vintage metal cabinets that I had found over the years at the thrift store, stashed in my garage because I never knew what to do with them (other than stacking them up and holding hubby’s DVD collection). 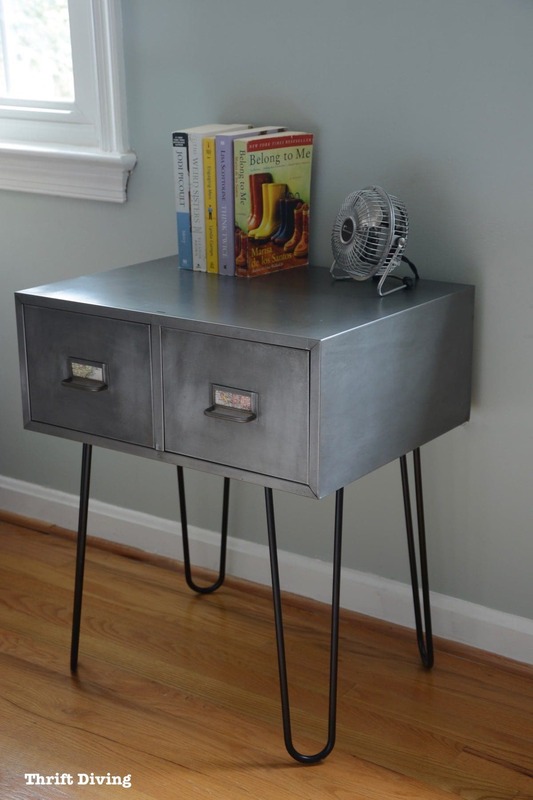 Pete showed me one of his vintage metal cabinets that he had converted into an industrial furniture end table with hairpin legs. I’d had a couple vintage metal cabinets on which I could replicate the same look, and I couldn’t wait to try! Now……I’m not one to “steal” or even “borrow” project ideas from others because I love for my projects to be original…. (You know how we bloggers do). But Pete solved my problem of what to do with this industrial vintage metal cabinet that was just sitting in my garage, taking up space. Times like this, you’re inspired and you don’t even care if you’re a copy cat! 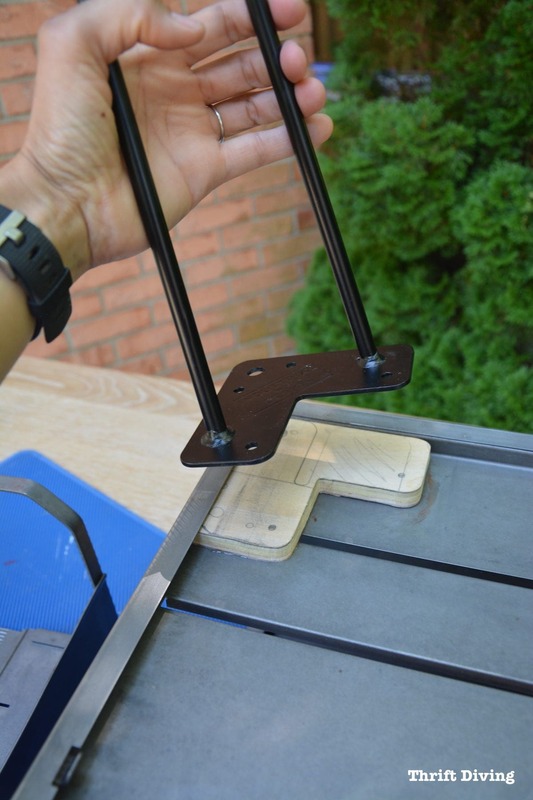 If you recall, I recently wrote a post called Dip and Strip 101: Everything You Wanted to Know About Stripping Wood and Metal. It was about hiring professional strippers to “dip and strip” your projects into big vats of a chemical stripper in order to restore it back to its original beauty. Pete told me all about it, but I wanted to interview the owner of local “dip and strip” professional stripping business to get the inside scoop. In addition to interviewing Mara, the owner of ChemStrip, I wanted to drop off my vintage metal cabinet to test out her services. And since Pete sold me on the industrial vintage look, I couldn’t wait to see how this metal cabinet would look all stripped! 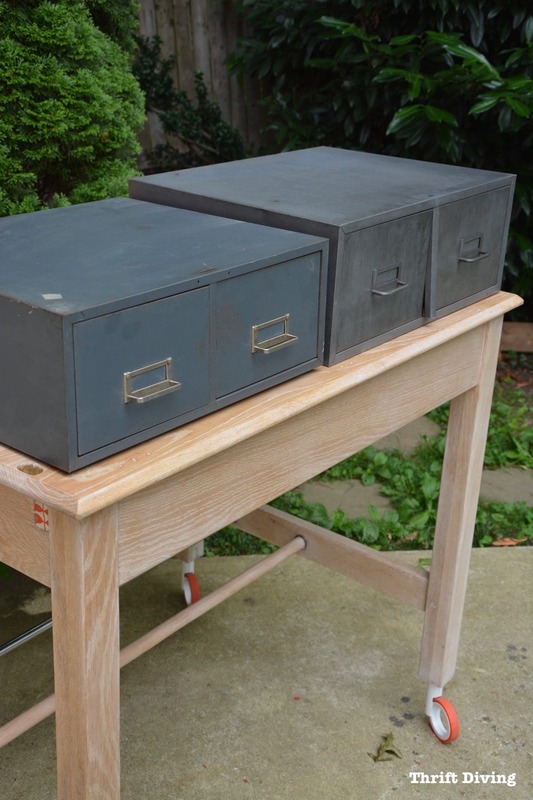 It turned into the cutest little industrial furniture side table with hairpin legs! In order to create this look, I have to buy some things, but several items I had on hand already. This post contains affiliate links). (This post contains affiliate links). Before I kick off the tutorial, let me show you a side-by-side comparison. The cabinet on the left is another one of my thrifted metal cabinets, and you can see if has a dull coating on it. The one on the right is the cabinet I used for this makeover, and that is what it looked like after I brought it home from the professional strippers. You can see the raw metal is a bit more trendy, but it definitely needed some cleaning up! 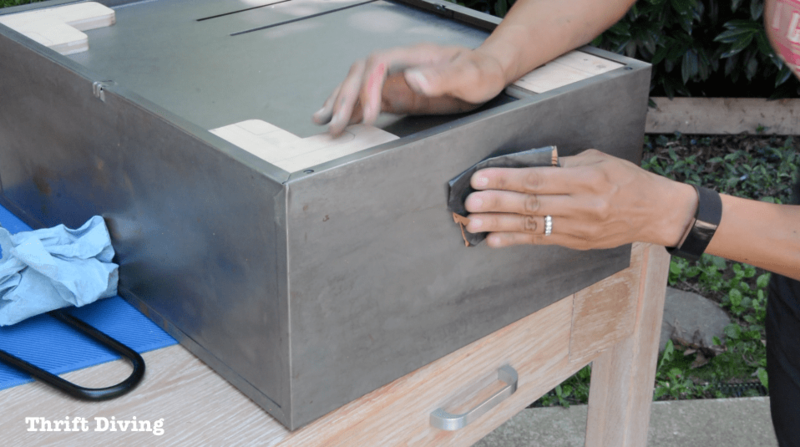 After the metal cabinet was professionally stripped, the refinishers applied a fine coat of oil to help minimize the quickness of the rusting. Thank God for that, because this cabinet sat in my garage and inside my house for a solid month or more before getting to this makeover! GASP! During that time, it did start to rust a little, but thankfully, with the light coat of oil, it didn’t rust very much. 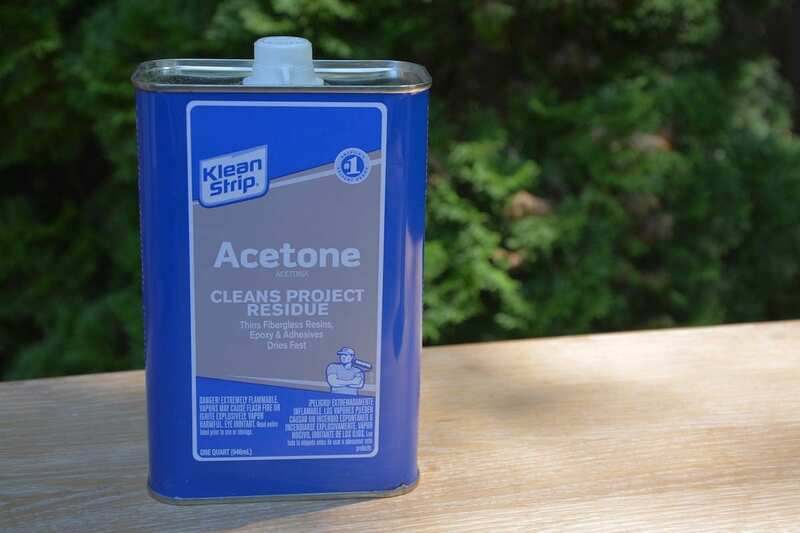 The folks at ChemStrip recommended I clean the metal cabinet with denatured alcohol or acetone in order to remove the light coating of oil before painting or spraying it. I used a clean lint-free cloth to clean it and had on some big mama-jamma chemical gloves to make sure that stuff didn’t touch my skin! 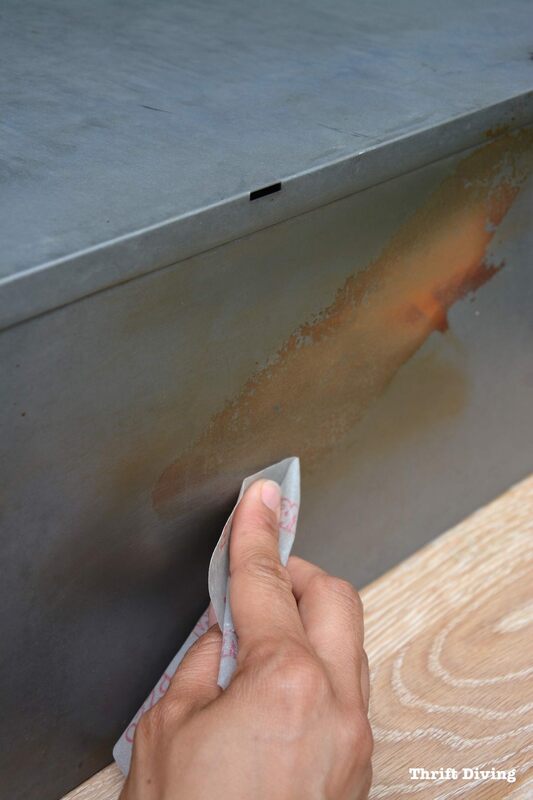 When I picked up the cabinet from ChemStrip, the back of the cabinet had a huge rust spot. I’m not sure why this happened, other than it must have been exposed to the elements before it was coated to help slow the rusting process. Whatever the reason, I had to do my best to sand out as much of the rust as possible. I started with 220-grit sandpaper, but even as fine of a grit, that was way too scratchy and left the metal dulled and scratched. So I bought 800-grit sandpaper which was suuuuuper smooth, but just enough grit to polish out the metal and remove some of the rust (although it never came out completely). TIP: Be sure you wear a dust mask when sanding, even if you can’t see the super fine dust! After sanding it down with 800-grit sandpaper, I followed up with 0000 Very Fine steel wool. 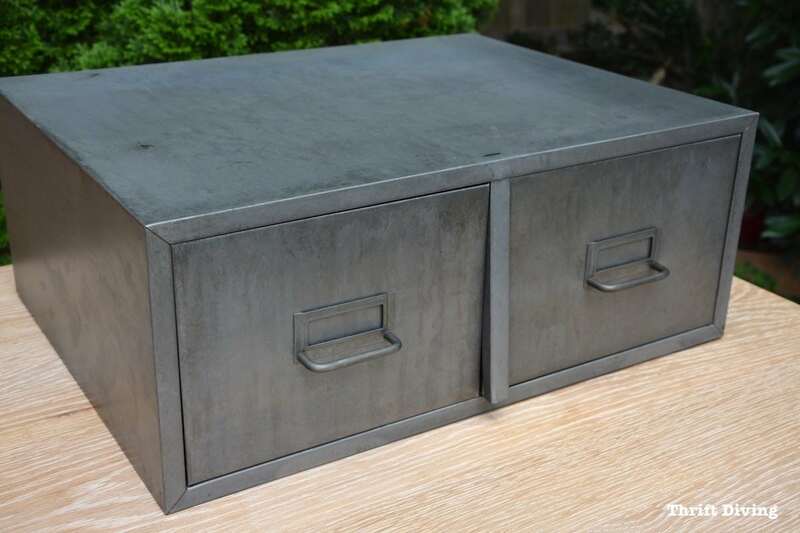 Here you can tell the huge difference between one drawer that was sanded and smoothed with the 800-grit sandpaper and very fine steel wool (LEFT) and the metal cabinet drawer that hadn’t been! Rust will eat through metal soooo fast. Because I had left the cabinet sitting for a good while before refinishing it and spraying it with lacquer to protect it, it started developing some rust spots, as you can see above. But thankfully, I was able to sand it well and get rid of rust on the metal. 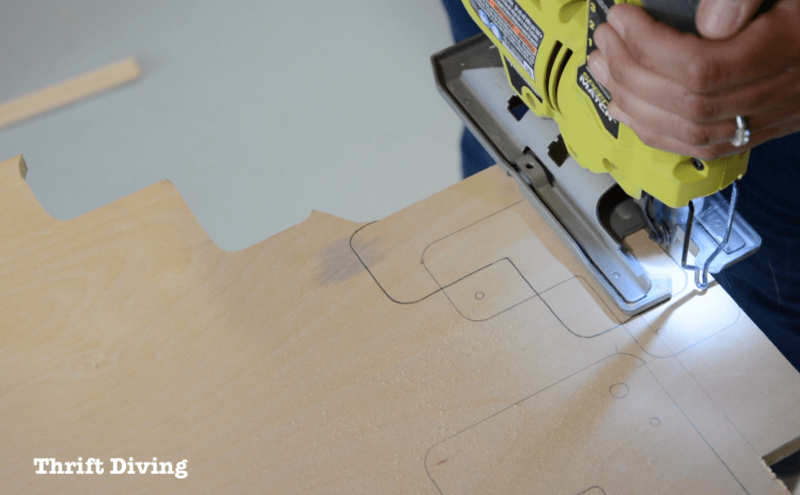 At first, I thought it would be as simple as tracing out the shape of the hairpin legs on a sheet of 1/2″ plywood. But then I realized that the vintage metal cabinet has a little “lip” on the bottom edges where the wood slid under nearly 1/2″. So I decided to cut the pieces of wood a little bit longer so that about 1/2″ could slide under the lip, yet still be able to attach the hairpin leg accurately and securely. You never really know which adhesives to use, do you?? 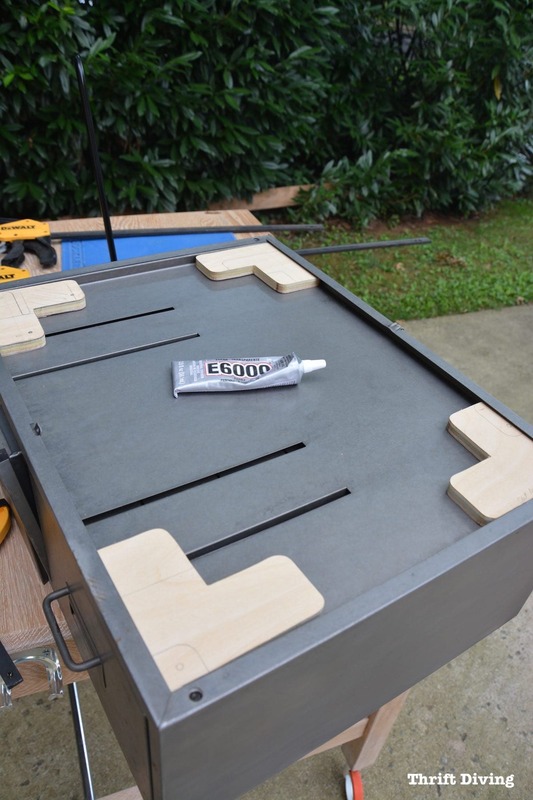 But a friend recently recommended I pick up a tube of strong adhesive called E6000. According to him, it works really well, and since he knows what he’s talking about 99.9% of the time, I took his advice. Since I already had it on hand, I used this to glue down the wooden supports to the bottom of the vintage metal cabinet. I needed clamps to keep those babies securely in place. It usually takes 24 hours for E6000 to dry, but the tube says that it can take up to 72 hours for total adhesion to occur. There were some other things I had going on, so I let it sit and harden for about a week, since I didn’t have time to work on it anyhow. After that week, I finally had some time, so I came back to work on it. Next, all I had to do was sit the hairpin legs on the wooden base and then screw them down. 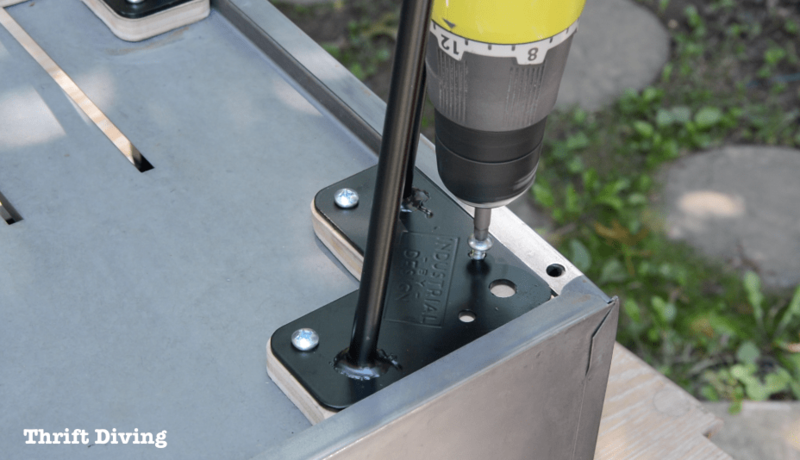 I wasn’t sure what screws to use, but I knew that I needed something fat enough and long enough to secure the legs so they wouldn’t loosen up over time. 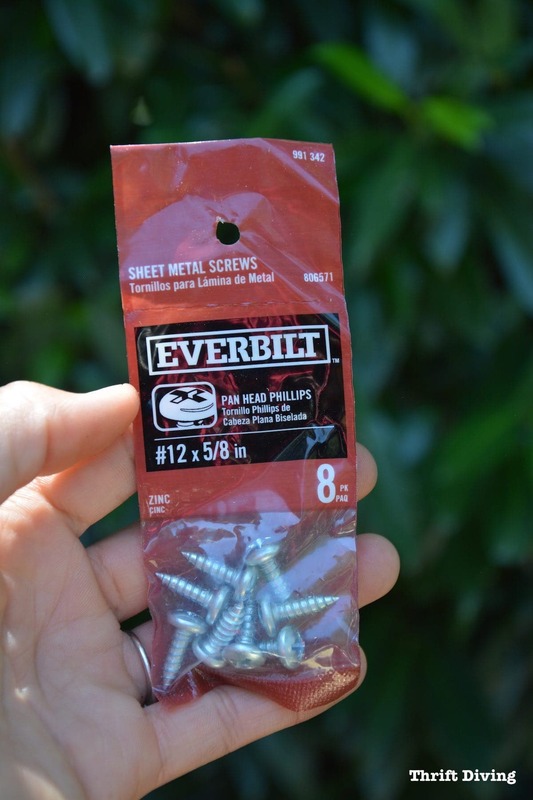 I ended up going with these 5/8″ screws, which were juuuusssttt long enough to secure it but short enough not to poke a hole through the metal when attaching hairpin legs! Before I continue with the tutorial, let me just say that I love hairpin legs, but they’re sooo expensive!! The most affordable place I could find for a set of 4 legs in a 16″ height (which is perfect for a side table or bedside table) is on Amazon from a brand called Industrial By Design. For $50, they’re heavy duty, they ship really quickly, and are rated 5 stars on Amazon. Can’t beat that! 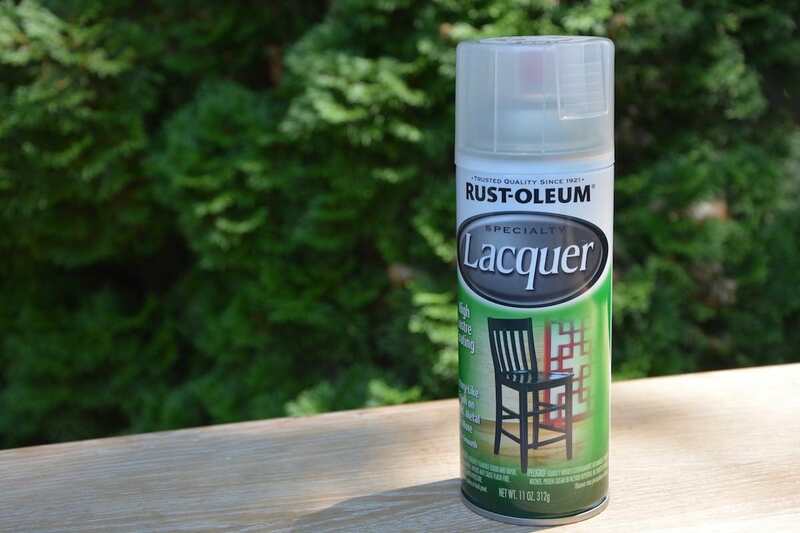 My friend Pete suggested I use a clear spray lacquer to prevent rust on my metal cabinet. I wasn’t sure how shiny this would be, so I tried a clear matte spray, as well. 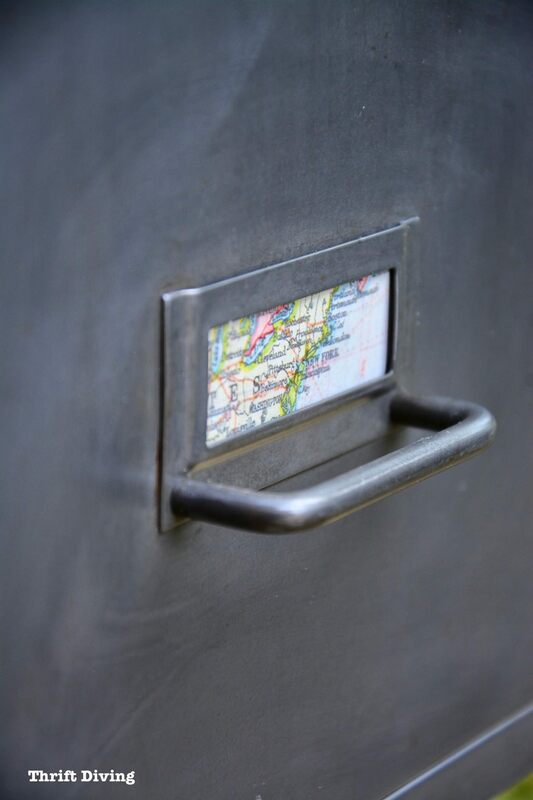 How boring it would be to just add labels to this vintage metal cabinet! I decided to cut out small rectangles from a map: one drawer with a map that includes Washington DC (my ‘hood….well, at least, the suburbs! LOL), and the other side with a map of Ghana, West Africa (gotta represent hubby’s homeland!). STEP 10: Show It Off to Friends and Family! I wasn’t sure where in the world I was going to put this piece! I decided to put it in my bedroom for the time being, but I’ll likely have to find another place for it since this space is already occupied by my custom tile table top. The only thing that didn’t turn out to my satisfaction is that there’s a slight wobble to my vintage metal cabinet! Waaaahhh! But like I’ve said before, DIY isn’t perfect! 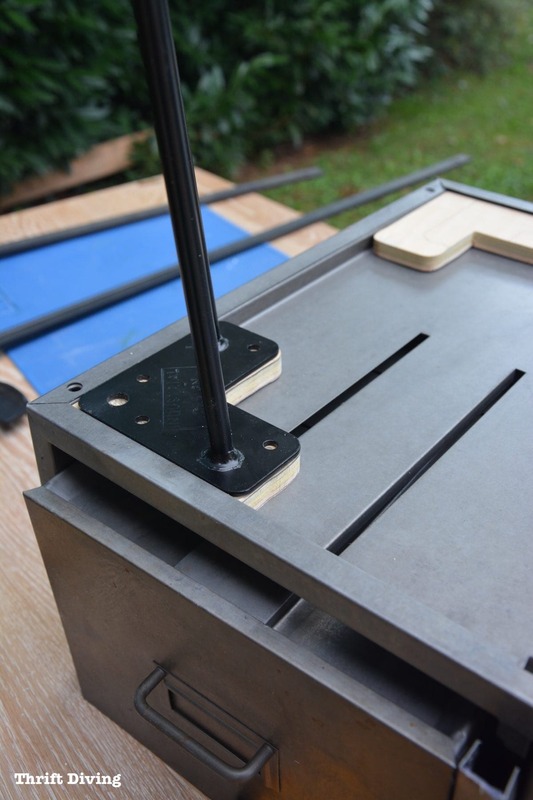 Perhaps if I had attached the hairpin legs to a solid 1/2″ piece of plywood glued to the bottom of the cabinet (like Pete had suggested) it would have been “perfect.” But I didn’t want to see a slab of plywood poking out like that. 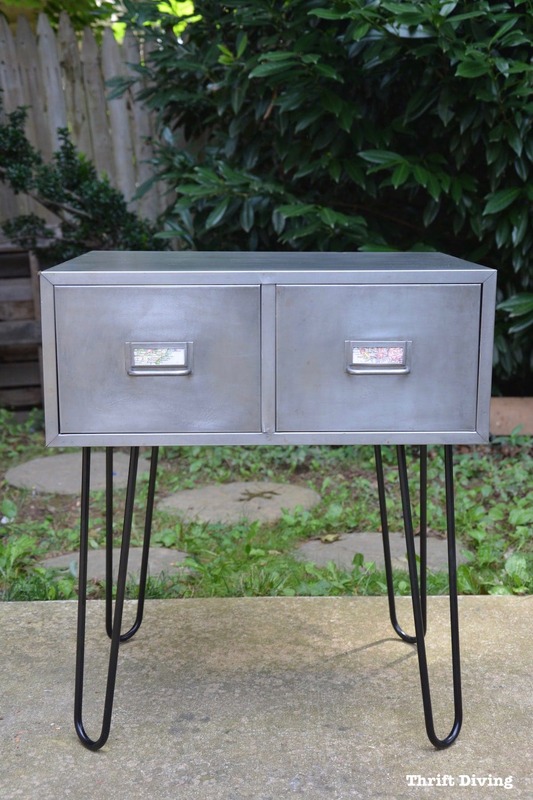 How Much Did This Vintage Metal Cabinet Makeover Cost? Let’s have a look at the cost! 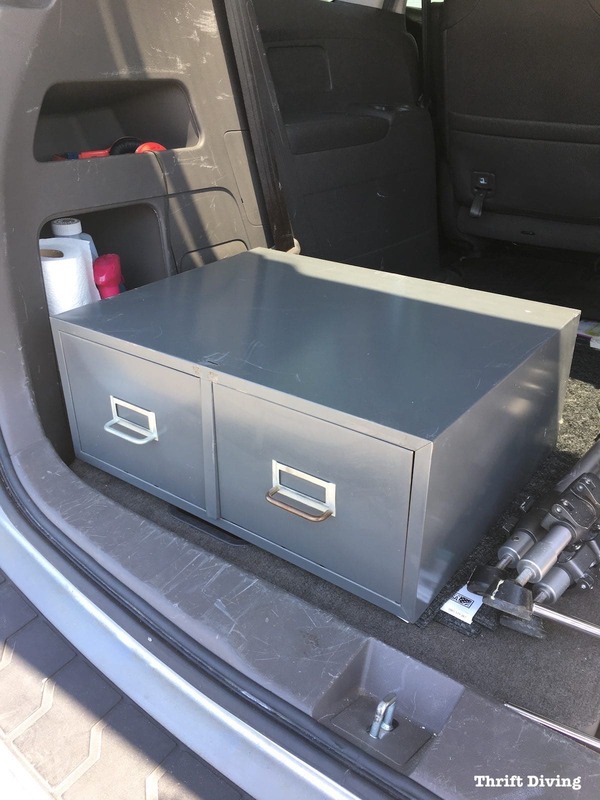 $7.00 – Vintage metal cabinet from the thrift store. All other materials I already had on hand and didn’t have to pay extra for. From start to finish, about 1 week or more, only because I took the time to let the glue dry and got sidetracked with other stuff. 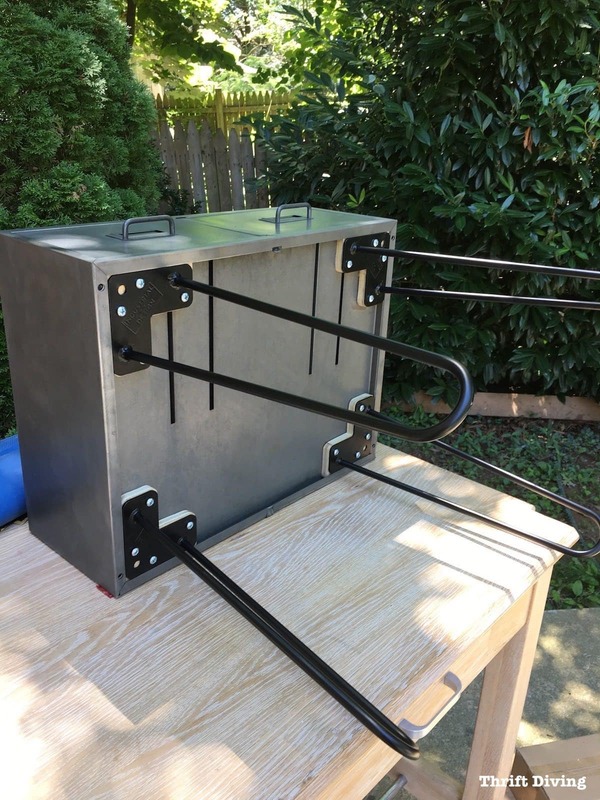 A very doable project if you’re short on time! 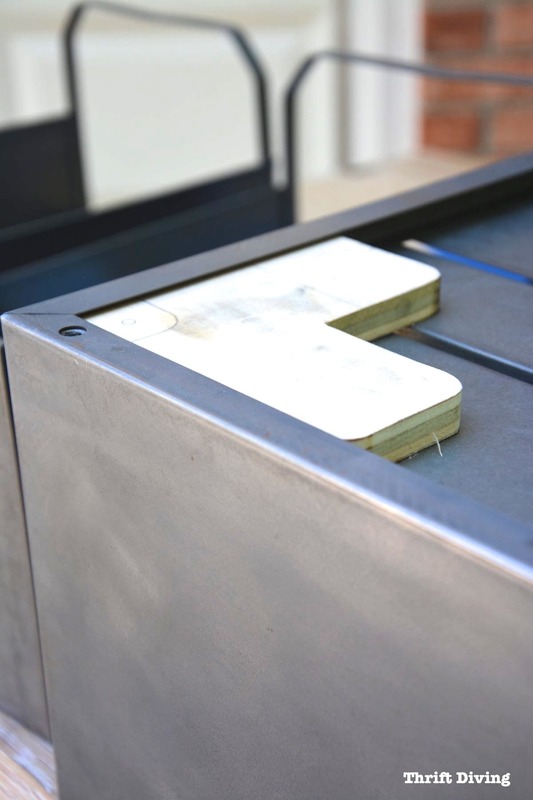 And I know metal cabinets aren’t just floating around your local thrift store all the time. 🙂 So think about building your own cabinet out of plywood and just spray paint it silver to look like industrial furniture! 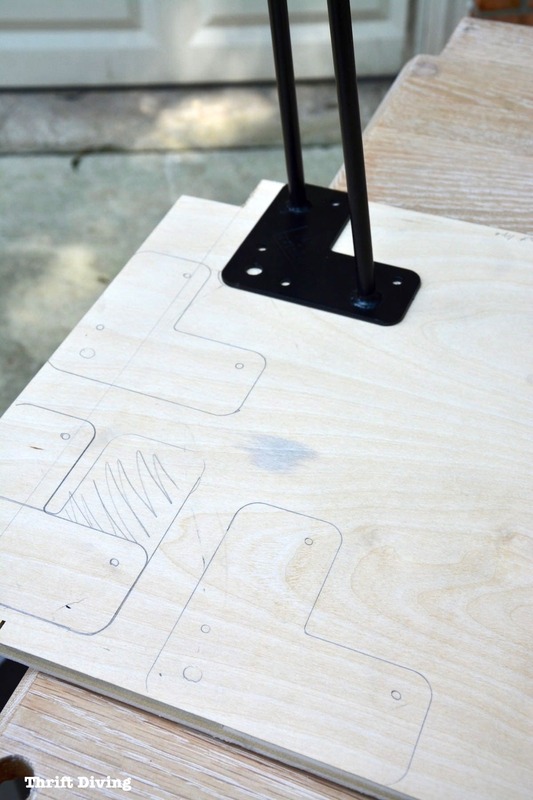 You don’t even need to make drawers. So What Do You Think About Industrial Furniture?? I think I’m in love with the industrial furniture look, and I can’t wait to refinish more vintage metal cabinets! Next time I’ll try stripping them myself and I’ll let you know how that goes! 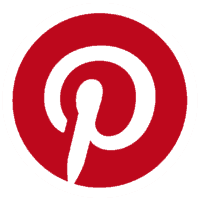 Leave a comment below and let’s chat about industrial furniture and vintage metal cabinets! What a beautiful project and such a great tutorial!! Amazing the difference in the piece with the new patina. Love it!! Rust is so crazy! So fast! I love the map labels, and great tips for adding the legs. Wow, you are so creative!! I love how it looks, so chic and industrial-looking at the same time! I absolutely love this makeover! I totally need to find 2 of these to turn into bedside tables. Thanks for sharing your awesome tutorial with us at Merry Monday this week! Love it! You are blessed to have such a creative flea market partner. And you do really good work. I fished out a coffee table with hairpin legs out of my neighbor’s trash; I just liked the look of it and thought maybe I could make a few dollars in the process. Now Im doubly glad I did, after seeing your post! Its rustic wood on the top and the hairpin legs are matte black. Im thinking I need to do a put of sanding the wood, then protecting it with a matte finish, so using the coffee table wouldnt be hazardous! I’ve never been an industrial gal, but when you see enough of something it starts to grow on you, and I love this! I can see so many uses for this little cabinet. I love hearing about your adventures with “Thrift Store Pete”. Have you ever thought of doing a whole post on/with him? It would be fun to see some of his stuff and spend a day with the two of you. Love this post. Keep em coming! Oh and yes, hubby is adorable…just like you. That little industrial cabinet is ever so edgy! And the two little map pieces just pop! Great job….. This isn’t my style, but it would be great for my college-aged son. Practical and modern/industrial looking for an engineer. Nice job!